Freestanding Tubs: A staple in bathroom renovations, freestanding tubs are a timeless addition to any bathroom, and exude elegance. In 2015, composite material tubs are gaining popularity over the traditional acrylic tubs. They are matte in finish and more relaxed in structure, providing versatility in both modern and classic bathrooms. With the renewed interest freestanding tubs, design firms rolling out aesthetically and economically pleasing models in their new lines. Adding luxury, decadence and the appearance of affluence to any bathroom, the standalone bathtub is all about revving up the style quotient while you enjoying a refreshing soak! Custom Vanities: More and more, home owners are seeking out custom additions to their spaces, and the bathroom is no exception! Custom vanities are high on the wish list of many home buyers or renovators, both for design and practicality. The inclusion of makeup counters, extra storage space, and even technology are making possibilities endless! Floating vanities are on trend, as are geometric mirrors. Round or Hexagonal shaped mirrors featured over traditional square or rectangle vanities bring fun to a utilitarian space by embracing new shapes. 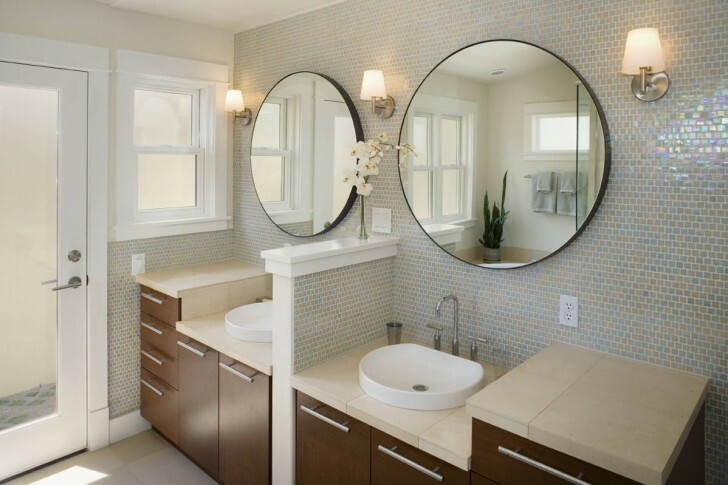 For maximum impact, mount your mirror on a tile mosaic or patterned wallpaper. This ups the drama of your space and makes your vanities a feature of the room. 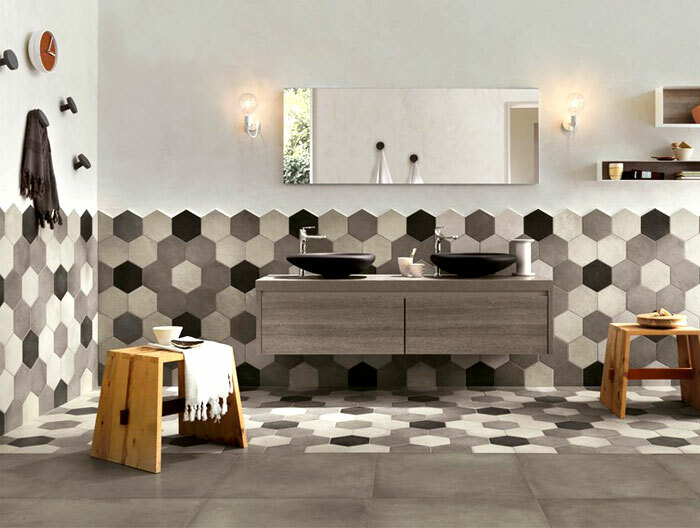 Geometric Tile and Grout: In 2015, bigger is better when it comes to tile. Oversized hexagon and chevron tile patterns in marble are adding gorgeous visual impact to traditionally simple bathroom design. Honeycombs, subway tile and intricate chevrons are the most popular trends for this year. Geometric tiles are a great design solution for those who wish to add depth to a plain, neutral space, and can also feature bold colours. Another great way to add colour to geometric tiling is through colourful grout. Grout is no longer mundane when it comes to modern bathroom design. Using grout creatively in bathrooms can highlight the pattern of how a tile is laid, showcase specific tile types and create a great modern spin on the traditional subway tile. We’re seeing grout in all the colours of the rainbow in 2015, as a way of stepping up the design of an essential part of tiling. Hardware: Hardware is an important part of the design in any room, but especially important in the bathroom! There are two competing trends when it comes to luxury bathroom design in 2015: all-white hardware and gold-plated hardware. Here’s the details on both! White: While not for everyone, white faucets can add modern flair to your space. All-white hardware creates a crisp and simple look that is an artistic shift from traditional chrome. These faucets look chic in light colours bathrooms (the ever popular monochromatic look) or paired with a darker backdrop, as standout pieces. Gold-Plated: If white faucets aren’t for you, why not take your hardware in a more glamorous direction? 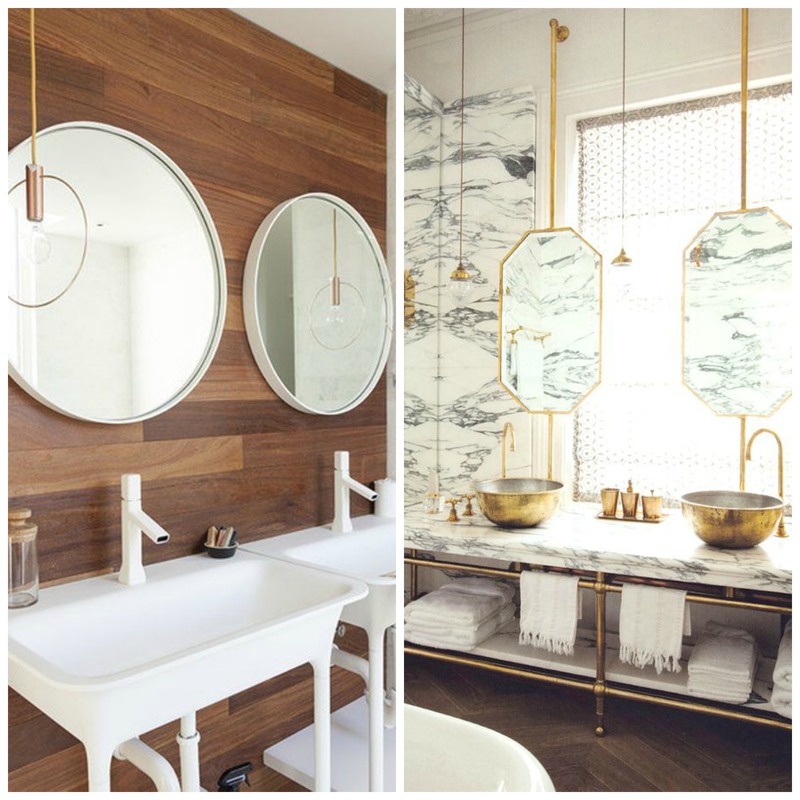 Undeniably elegant, gold plated hardware is making a resurgence in 2015 bathroom design trends. This year, gilded accents are coming in the form of hardware, lighting and even plumbing. The key? 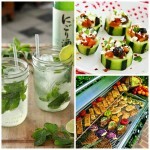 Use it sparingly for the most chic and modern impact. Pair gold-plated faucets with vanities that have minimal hardware or integrated pulls. Restraint is important when it comes to keeping gold-plated hardware looking sophisticated. Natural Finishes: Drawing inspiration from nature can warm up a bathroom and infuse the space with calm and relaxation. Following the spa-inspired trends for luxury bathrooms in 2015 may mean reaching for natural finishes. Using earthy materials like natural stone or wood-like tile can bring the peacefulness of nature to your space. Use planks or reclaimed wood to create a wooden feature wall or for your custom vanity, and incorporate plenty of plant life. 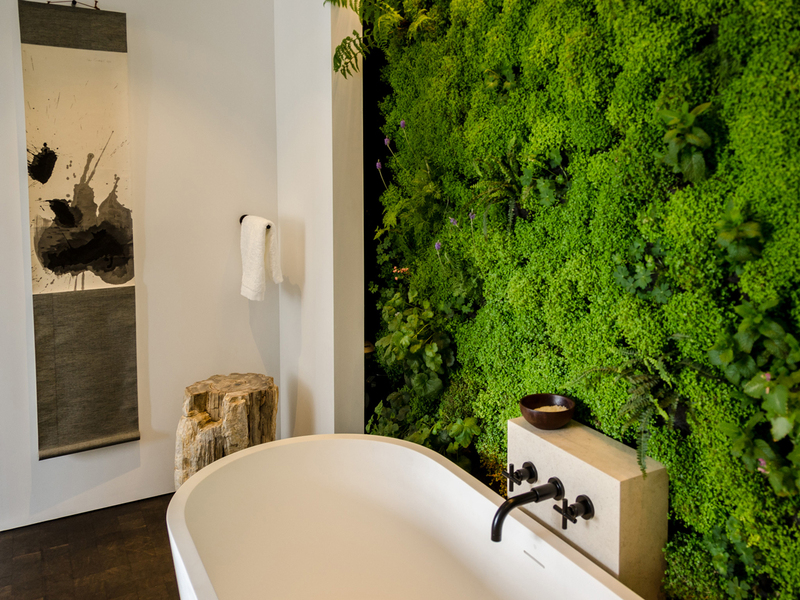 Living walls or bathmats are a sophisticated alternative to potted or hanging plants. Succulents are a great low-maintenance choice when it comes to living walls. Rainfall showers can add to the feeling of tranquility. The bathroom can be a centre of relaxation and tranquility in your home. If you’re considering a renovation, or researching new homes, look for these trends! 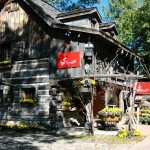 They will not only increase resale potential, but you’ll love having a spa-like place of peace right in your own home.